The hottest part of summer yields the most flavorful fruit. I've come up with a kid-approved Popsicle featuring watermelon. And, I found some Popsicle recipes from other military spouses featuring strawberries and pineapple, so you have a few healthy choices for cool treats this summer. The ingredients for my Popsicles came from a few different places. In a recent trip to the Nashville Farmers' Market, I acquired some Meyer lemons, a hybrid of lemon and orange with a thick peel and sweet-tart fruit. While many people preserve these sweet delicacies in salt for later use, I wanted to savor them in the heat. I also picked up a watermelon from a roadside farmer and half of it was sitting in the fridge waiting for me. A windowsill mint plant was showing signs of wilt and begging for purpose, so that will go into the mix as well. And the last exciting ingredient — mangos, fresh from Florida, shipped to me from family that lives near a mango grove near Fort Myers. Popsicles, yep, that's what we are having. Okay, I know you are wondering — what about margaritas? Well, having baby due in October means I have to save some of this mix in the freezer for a later Taco Tuesday night. Living on an Army post in Fort Rucker, Alabama, we take advantage of the 2-minute drive to our neighborhood pool at least weekly. In the short time we have been here, a tradition has emerged - Popsicles! In the past, we took ice pops, the kind you tear open with your teeth and squeeze juice and ice up to the top — staining everything below. In an effort to find a replacement for these electric-colored plastic pops, I dug our Popsicle molds out of the Little Chefs' kitchen box. Between the measuring cups, spatulas, and spoons, I found all the pieces needed for our creation. Kitchen floor playtime begins with this box. The older the Little Chefs grow, the more they get to use the supplies on the counter with me. Turning playtime into cooktime creates a foundation for love of food and interest to try new things. We gathered supplies for the summer treat — Meyer lemons, gigantic watermelon, fresh mint leaves, mangos, and honey. Little Chefs first pick apart mint leaves and toss in, I cut the peel off the lemons and watermelon, we dissected the mango, and all went into the smoothie blender. Little Chefs can cut soft pieces like mangos and watermelon with a kid-safe knife such as a butter knife or plastic knife. After all ingredients were mixed and soupy, Little Chefs scooped the puree with measuring cups and poured into molds. We topped off the messy mix with popsicle sticks and froze for later. The next pool trip went off without even a notice of missing the plastic pop ices. Since the little Chefs were part of making the ice treats, they were also eager to taste the new food. 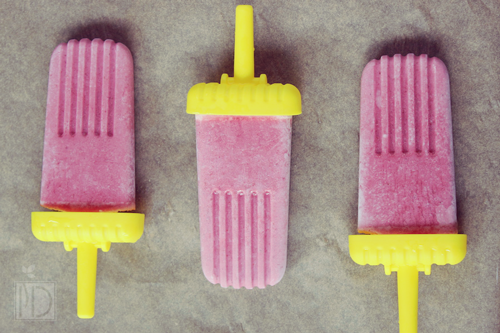 3 Fruity homemade Popsicle recipes. Looks like some yummy fruit pop recipes! 1. Puree ingredients in blender. 2. Pour blended mixture into bowl for easy scooping if Little Chefs are helping. 3. 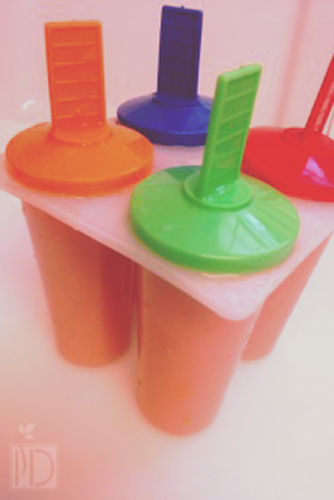 Scoop mix into Popsicle molds. 5. Place in water up to middle of mold to loosen pops when ready to eat. Once the liquid mixture comes to a low boil, turn off the heat and cover the pot to steep for 45 minutes. Strain the liquid through a fine mesh strainer and add to blender with the strawberries. At this point taste for sweetness and add more honey if desired. You can also add peppermint extract if you'd like it a little more minty but I didn't find this necessary. Combine all ingredients in a blender or food processor and blend well. 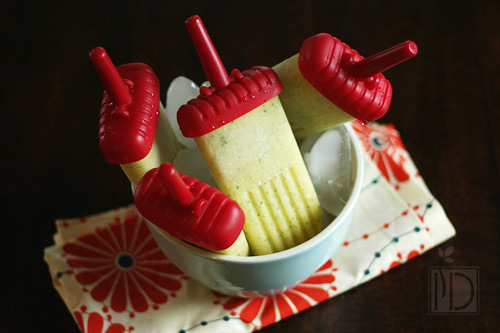 Pour into Popsicle molds and freeze for at least two hours. *Alter the sweetness of these to your tastes. Just remember when frozen, fruits are not as sweet as unfrozen. What is your favorite healthy frozen treat recipe?